While operations continued at Iver Johnson's Arms at their Jacksonville, AR location during their Chapter 11 Bankruptcy, the money owed Louis Imperato by Phillip Lynn Lloyd and others led to the return of the company to Louis Imperato. On February 2, 1987 Imperato incorporated AMAC, Inc., doing business as Australian Military Surplus Enfield Enterprises. It appears Imperato also acquired some or all of the damaged 43,500 Australian Enfield rifles that had contributed to the bankruptcies in 1986. On company internal documents Imperato identified AMAC as "American Military Arms Corporation" with Iver Johnson Arms being a division of AMAC. The name "American Military Arms Corporation" was not incorporated in Arkansas until September 11, 1989 when it was incorporated by another investor, Neal Paul Fisk of Mountain Home, AR. Imperato managed Iver Johnson's Arms in Jacksonville, AR from his office in Brooklyn, NY. 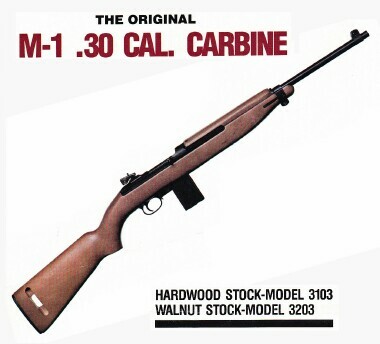 The AMAC catalog for 1987, the only AMAC catalog/brochure found to date, showed a dramatic decrease in the number of carbine models to only one, with a choice of either a walnut or hardwood stock. The Enforcer model later offered by AMAC was not included in the brochure and may not have been available yet at the time the brochure was printed. With the change of the company name to AMAC, the Iver Johnson name and logo was replaced by the AMAC name and logo. 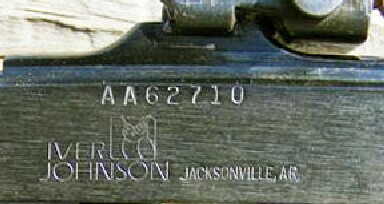 Receivers for the French Short carbine with the Jacksonville, AR markings of this time period have been located but it is not known if they actually produced and exported these carbines as the receivers observed were obtained by Numrich Gun Parts when they purchased leftover receivers and parts sold at auction by Iver Johnson's bankruptcy trustee. AMAC continued production of the TP22 pistol in .22 long rifle and .25 ACP. They produced the .380 Pony pistol in limited numbers from 1988-1990. All handguns were marked with the AMAC name as opposed to the Iver Johnson name. The Special Application Shooting System sniper rifle continued to be available by custom order. The Erma Werke manufactured Iver Johnson semi-auto, lever action, and pump action .22 rimfire rifles as well as the Lil Champ .22 bolt action rifle were offered in 1987 only and discontinued thereafter. In 1989 AMAC/Iver Johnson re-introduced a 9mm carbine they called the Delta 786. This carbine was similar to the 9mm model offered 1985-1986 but with a matte black finish. It was intended for the civilian, law enforcement, and military markets. It's not known if this model was actually manufactured and if so what serial number prefix was used. Iver Johnson Arms successfully cleared Chapter 11 bankruptcy on May 9, 1989, however, on December 18, 1990 they filed for Chapter 11 protection again using the name Iver Johnson's Arms & Cycle Works. As you read this keep in mind advertisements are commonly placed months in advance of when they are actually published. It is likely orders for the following were being taken from distributors and filled prior to their advertisement in The American Rifleman. Distributor and retail sales continued to occur after Iver Johnson was no longer in business. 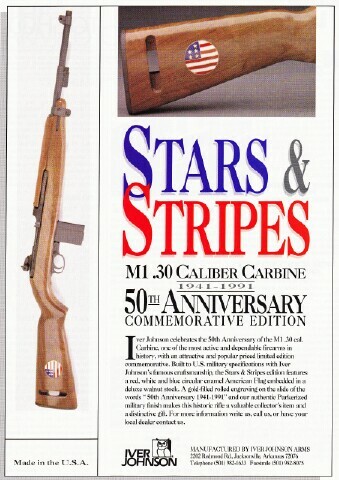 The April 1991 issue of The American Rifleman carried a full page advertisement introducing Iver Johnson's Stars & Stripes 50th Anniversary Commemorative edition. These can be readily identified by a round medallion inlay in the right side of the stock depicting a modified American flag. These are marked with the Iver Johnson name. 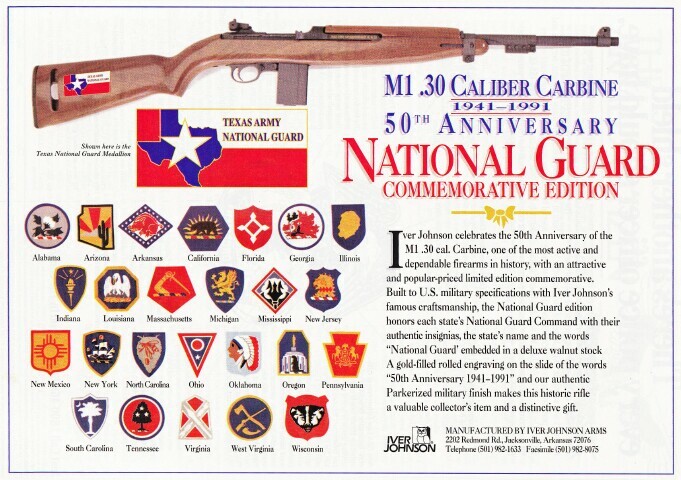 The following month in May 1991 The American Rifleman carried a full page advertisement introducing Iver Johnson's 50th Anniversary National Guard Commemorative edition. These were the same carbine as the Stars & Stripes edition with the customer's choice of state flags instead of the U.S. flag. Both of the commemorative models introduced in 1991 were spin-off's of the earlier WWII Commemorative carbine, manufactured by Iver Johnson's Arms for the American Historical Foundation and first advertised in the January 1985 issue of The American Rifleman. The WWII Commemorative featured a round WWII medallion in the stock, several gold plated parts, and gold inlaid lettering in the slide. The advertisements for the Stars & Stripes Commemorative's and National Guard Commemorative's showed the gold plating and gold lettering but these were absent on many of these commemorative's. The vast majority of these 1991 commemorative's observed to date have been the Stars & Stripes Commemorative's. Serial numbers of these two commemorative's are intermingled with one another and the standard model carbines between s/n AA66756 and AA73377, with the majority of carbines in this block of serial numbers being the Stars & Stripes Commemorative's. A large quantity of the medallions for the National Guard commemorative's were purchased in early 1994 by Numrich Gun Parts from the auction of Iver Johnson's assets. These facts, with the timing of the introduction of these two carbines to the Chapter 7 bankruptcy discussed below, may indicate very few of the National Guard commemorative's were actually sold. The commemorative models will be covered in more detail in Section II. For information on serial numbers refer to Section III. On March 12, 1991 Iver Johnson's Arms & Bicycle Works converted their Chapter 11 Bankruptcy to a Chapter 7 Bankruptcy, meaning the company was unable to survive restructuring. With the Chapter 7 filing the management of all AMAC/Iver Johnson's assets and debts was turned over to the bankruptcy court. During the bankruptcy proceedings the company continued to exist as it's assets were liquidated and debts paid but all operations were conducted under the direction of the court and court trustee. ATF production records for 1992 would have been under the management of the court trustee in liquidating the company's assets. The court trustee filed a final report on the sale of the assets of Iver Johnson's on May 12, 1994. Proceedings thereafter focused on the distribution of the money obtained from the auction and sale of the assets. The Chapter 7 bankruptcy proceedings ended on February 7, 1995. Many of the gun parts and accessories from Iver Johnson's were purchased at auction in early 1994 by Numrich Gun Parts and as of 2013 are still being sold on their website and several retail auction websites. In the mid 1990's Israel Arms International purchased hundreds of Iver Johnson's receivers from Numrich, with which to start the production of the IAI M1 Carbines. In Arkansas courts and the bankruptcy proceedings of the late 1980's and early 1990's, the investors who had purchased Iver Johnson's Arms from Imperato in 1982 took efforts to relieve themselves of the debts they still owed Louis Imperato. Arkansas Business magazine dated March 10, 1997 indicates "Penick, Flake and Wallace all negotiated separate financial settlements with Imperato in 1994. According to Imperato, Flake and Penick have honored their agreements." ... "Wallace's 1994 settlement with Imperato originally totaled $1.1 million. He paid $100,000 up front as part of the settlement agreement. The remaining $1 million was broken into 11 promissory notes." ..."Wallace has admitted he hasn't paid a dime toward the $1 million owed to Imperato. His prime defense was based on a provision in the settlement stating he would provide business leads to Imperato. A portion of any profits made from leads supplied by Wallace would be used to offset money he owed to Imperato. Wallace claimed he supplied leads to Imperato but had received nothing in return. Imperato testified in a sworn affidavit the two leads Wallace provided him were dead ends, with no deals resulting from them." ..."The first of the two would-be arms deal leads Wallace provided to Imperato was Yassar Arafat, head of the Palestinian Liberation Organization. Arafat was interested in buying police supplies in the summer of 1994. An autographed picture of Arafat was among the furnishings carted away from Wallace's former office by U.S. Marshals. The other lead was George Hallaq of Athens, Greece. Hallaq is referred to as "ambassador" in business correspondence from Wallace. The February 1995 lead involved Hallaq selling 10 million rounds of British .303 ammunition made in Greece to Imperato." Arkansas Business magazine dated March 23, 2009 ... "Wallace ponied up in 1997. "I paid $950,000 to a man last week I didn't think I owed a penny to," Wallace told Arkansas Business. "I've been the bad guy when I've had to pay other people's debts." But Wallace still owed almost $200,000. That debt hung over Wallace for years. Imperato finally landed a $250,000 summary judgment in U.S. District Court in 2001." Federal Civil Court records show Wallace failed to follow through with this settlement, with Imperato repossessing many of Wallace's belongings until the debt was finally paid in full in 2006. 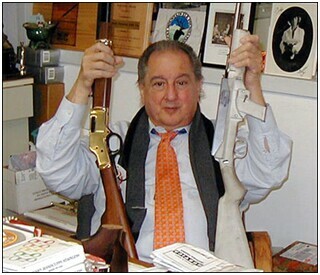 By 1998 Louis Imperato and his son Anthony had started Henry Repeating Arms in Brooklyn, NY. Louis passed away on November 28, 2007 and the company is now run by his son, Anthony Imperato with their headquarters in Bayonne, NJ. ATF reports 1987-1992 were under the name of AMAC, Inc. No rifles appear in the reports for 1991 and 1992. These totals include all rifles of all calibers manufactured at the Jacksonville, AR facility. The rifles manufactured by Iver Johnson/AMAC that are included in these quantities were the Special Application Systems Rifle (special order, low quantities), the Lil' Champ .22 rifle (manufactured 1986 & 1988 only), with all others being their M1 Carbines. Of the 10,412 rifles manufactured 1987-1990, carbine serial number data collected to date indicates at least 8,400 of these were M1 Carbines. The actual total was very likely much closer to the overall total. Notice the Enforcer model carbine was absent 1987, 1988, 1989 and 1991. 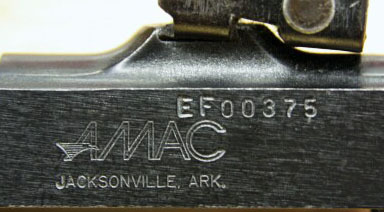 AMAC Enforcer serial numbers observed so far have been EF00375 through EF00535, followed by EF00601 through EF00754 with the last Iver Johnson markings and logo. Assuming no serial numbers were skipped these serial numbers indicate AMAC sold at least 379 Enforcers 1987-1992, with the AFMER report data indicating 247 of these were manufactured during the same time period. The difference between these two numbers were probably the Enforcers AMAC acquired when taking over Iver Johnson's assets in 1987. As mentioned above, Chapter 7 Bankruptcy on March 12, 1991 placed all of the assets of Iver Johnson/AMAC under the control of the bankruptcy court. Notice the decrease in production leading down to no production in 1991. Those reported as manufactured in 1992 were allowed by the bankruptcy court trustee liquidating the assets of AMAC/Iver Johnson.